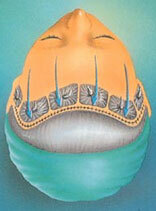 A forehead lift or "browlift" is a procedure that restores a more youthful, refreshed look to the area above the eyes. The procedure corrects drooping brows and improves the horizontal lines and furrows that can make a person appear angry, sad or tired.In a forehead lift, the muscles and tissues that cause the furrowing or drooping are removed or altered to smooth the forehead, raise the eyebrows and minimize frown lines. Your surgeon may use the conventional surgical method, in which the incision is hidden just behind the hairline; or it may be performed with the use of an endoscope, a viewing instrument that allows the procedure to be performed with minimal incisions. Both techniques yield similar results -- smoother forehead skin and a more animated appearance.If you're considering a forehead lift, this brochure will provide a basic understanding of the procedure -- when it can help, how it's performed and what results you can expect. It won't answer all of your questions, since a lot depends on your individual circumstances. Be sure to ask your doctor if there is anything you don't understand about the procedure. Patients who are bald, who have a receding hairline, or who have had previous upper-eyelid surgery may still be good candidates for forehead lift. The surgeon will simply alter the incision location or perform a more conservative operation.Remember, a forehead lift can enhance your appearance and your self-confidence, but it won't necessarily change your looks to match your ideal or cause other people to treat you differently. Before you decide to have surgery, think carefully about your expectations and discuss them in detail with your doctor. Your surgeon will help you decide which surgical approach will best achieve your cosmetic goals: the classic or "open" method, or the endoscopic forehead lift. Make sure you understand the technique that your surgeon recommends and why he or she feels it is best for you.The classic forehead lift: Before the operation begins, your hair will be tied with rubber bands on either side of the incision line. Your head will not be shaved, but hair that is growing directly in front of the incision line may need to be trimmed.For most patients, a coronal incision will be used. It follows a headphone-like pattern, starting at about ear level and running across the top of the forehead and down the other side of the head. The incision is usually made well behind the hairline so that the scar won't be visible.If your hairline is high or receding, the incision may be placed just at the hairline, to avoid adding even more height to the forehead. In patients who are bald or losing hair, a mid-scalp incision that follows the natural pattern of the skull bones is sometimes recommended. By wearing your hair down on your forehead, most such scars become relatively inconspicuous. Special planning is sometimes necessary for concealing the scar in male patients, whose hairstyles often don't lend themselves as well to incision coverage.If you are bald or have thinning hair, your surgeon may recommend a mid-scalp incision so the resulting scar follows the natural junction of two bones in your skull and is less conspicuous.Working through the incision, the skin of the forehead is carefully lifted so that the underlying tissue can be removed and the muscles of the forehead can be altered or released. The eyebrows may also be elevated and excess skin at the incision point will be trimmed away to help create a smoother, more youthful appearance.The incision is then closed with stitches or clips. Your face and hair will be washed to prevent irritation and the rubber bands will be removed from your hair. 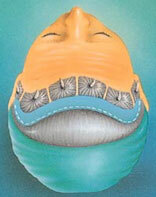 Although some plastic surgeons do not use any dressings, your doctor may choose to cover the incision with gauze padding and wrap the head in an elastic bandage.The endoscopic forehead lift: Typically, an endoscopic forehead lift requires the same preparation steps as the traditional procedure: the hair is tied back and trimmed behind the hairline where the incisions will be made.However, rather than making one long coronal incision, your surgeon will make three, four or five short scalp incisions, each less than an inch in length. An endoscope, which is a pencil-like camera device connected to a television monitor, is inserted through one of the incisions, allowing the surgeon to have a clear view of the muscles and tissues beneath the skin. Using another instrument inserted through a different incision, the forehead skin is lifted and the muscles and underlying tissues are removed or altered to produce a smoother appearance. The eyebrows may also be lifted and secured into their higher position by sutures beneath the skin's surface or by temporary fixation screws placed behind the hairline.